When looking through engine literature and talking with sales people, often times the term “continuous duty” is brought up to help make a point or even sell one product over another. Here’s my perspective on the subject. Uninterrupted service at 100% full rated power for an unlimited number of hours per year – In other words, the engine was designed AND rated for “pedal to the metal” 24/7/365, and this is the way I understand a true “continuous duty rated engine” or any appliance to be, AND give an acceptable life when operated like this. But know this; there is at least one popular engine manufacturer in the marine recreational market that has a very different definition of “continuous”. Seems Yanmar will rate an engine at, say, “maximum output is 480 HP at 3300 RPM” and on the next line say that the same engine has a “continuous output at the crankshaft” of 436 HP at 3198 RPM (about 70 hp per liter). What that actually defines has left me befuddled for about 20 years. I truly have no real clue as to what Yanmar actually means by that, and I’ve been a dealer for the product (over 10 years). Plus, all the while they have such strict guidelines as to operational hours per year. Makes zero sense, and I have no plausible explanation to this way of describing the word “continuous” as per Yanmar. Maybe someone else can add some reasoning to this that can explain Yanmar’s take on this. Or, I guess I could leave it as a clever marketing tactic?? In general, current engine design technology (I am talking 2008) allows an upper end of about 35 HP per liter on a high speed diesel engine (that’s a diesel classification of actual piston speed, not RPM (even though I am using continuously 1800 RPM rated engines for this discussion) up to about 60 liters of displacement that would have a rating like this, along with a consumer accepted reasonable life. Believe it or not, it is the consumer (his wallet) that really sets an acceptable standard as to engine life, and with today’s technology, I’d say that acceptable life needs to be in the range of 8000-16000 gallons of fuel burned per liter of displacement before we are at “TBO”. This fuel number is also based on a CONTINUOUS duty rated engine that is run in an overall duty cycle at 50-100% of its rated HP. Lower duty cycle = more fuel burn per liter ….. that’s one reason for the wide gallon per liter window size, and another is that more iron per rated HP seems to translate into more engine life per fuel burned before TBO. Now you ask, where did I come up with 35HP per liter. I didn’t, but if you search through all of the latest high tech diesels made by MTU / Detroit, CAT, CUMMINS, VOLVO, MAN, SCANIA, IVECO, JOHN DEERE, MITSUBISHI, etc., that actually go after the workboat market and really understand what continuous duty means, you’ll find that the UPPER limit is about 35HP per liter (about .6 HP per cubic inch – if you do some research, I think the Cummins QSK 19 at 660 HP is about as high as that number gets). But MOST continuous duty rated engines are actually below that number (20 to 30 HP per liter). 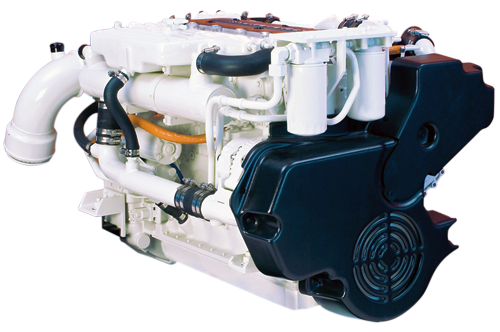 So, what could all of this really mean to people in the recreational marine market when we only talk about engines that are rated to 60 – 80+ hp per liter? Actually, not much because if the boat builders sold engines with this type of engine with a “de-rated HP output”, most of the boats they sell would never make it over the hump on DEMO day and would never sell. Performance sells the product, not engine longevity on sea trial day. Being applicable to this discussion and the point I am trying to make: Take any modern (mid 90’s and newer) 4-12 L diesel rated at 60-80 HP per liter (80+% of all the engines we talk about here are in this class), and YOU want to do it right. This is how I think your engine should be selected as to HP & size for your application. Be sure that you are happy with your vessel’s performance set up the way you will actually be using it (that means loaded with all you need to meet your application goals) burning no more than 2.2 GPH per liter at your happy cruise speed operating at a 30-50% duty cycle or less if you want a chance of seeing 5000 hours. If you need to burn closer to 2.5-2.6 GPH gallons per liter to get you up to the speed you need to go, you must accept a much lesser engine life (IMO, in actuality you may be borderline underpowered), and you may not see 2500 hours before your engine is history. I’ll bet the sales broker never talked along those lines – seems the only thing they know about diesels is something like 10,000 hours when the subject engine life comes up. If during this 2000-5000 hours you are propped to where you cannot reach rated speed or more, then the numbers will be even worse. Don’t believe this? All you need to do is ask yourself why so many of today’s modern small diesels are sold on the used market as “rebuilt”, or need rebuilding with such low hours. Keep in mind that if you run at 2+ GPH per liter or more, a simple problem (lose a coolant pump belt or impeller) that occurs running on the “edge” becomes a major issue compared to running that same engine at 1 GPH per liter. When you only have a 1400 – 2000 lb engine/trans package cruising at 2 GPH or more per liter, you have no time and no room for even the simplest overheat issue that might be caused from losing an impeller, engine coolant pump or hose. I could go on and on with this (actually I have in some past articles and postings). Regardless of how HP has gone up per liter over the years and the quality of the base product has gone up with it (it really has), you’ll find that these numbers are where you need to be if you want 10-15 yrs of engine life running 200-500 hrs/yr in recreational service in the typical planing boat that is sold for its “performance” qualities on plane. But take that same boat, get realistic about how fast you DON’T need to go, bring it down to hull type speeds and run those same engines at 10-20 HP per liter when traveling for hours, care for all as if these engines were your passion, and 10,000 hours and 20+ years of great service is very do-able if you follow all that I preach about in these forums. From here it’s your call as to what you want to believe and do. But if nothing else, do remember this when you shop – if you are not performance happy for cruising to your favorite 60-80 mile fishing reef at 2-2.2 GPH per liter or less PER ENGINE and expect to do that 25 times or so per year for 10 years, don’t expect your engines to meet that 10 + years life and 5000 hours no matter how often you change your oil. The Cummins QSB 5.9 is a super popular engine and I feel should be addressed here. Cummins or CMD has never rated it as a “continuous duty”, and I don’t really know why other than the market, has not needed it. They offer it in a “Heavy Duty” rating at 230 HP at 2600 RPM which is really very close; 8 hours out of 10 hours at WOT – Not bad and obviously they feel very confident about the quality of what’s inside. If was I was going to interpolate all I know about this engine and give it a 24/7/365 rating, I’d be very comfortable at either 165 HP at 2100 RPM or 155 HP at 1800 for a true continuous rating. Seeing 10,000 ++ hours before TBO time & run at a 50%-75% duty cycle at these rating should be a piece of cake if you treat all the rest right. Just remember this when you read thru my thoughts on this subject: You need to be sure to keep all in the context of understanding “Cruise HP” and where all of my politics on the subject come from. You need to understand “duty cycle” in its simplest form – there is a big difference in a 35%-45% duty cycle, compared to under 30% which is a recreational guideline by many manufacturers that seems impossible to meet if you fish 12-16 hours days 60-80 miles from shore, make long trips mostly on plane, AND / OR cruise at close to manufacturer’s CRUISE RPM’s which is usually 200 off the top. Overall though, I think the biggest problems are with the boats/engines that have changed owners multiple times over the first 300 hours spread out over 5-8 years. These are the engines that seem to be in the worst shape because real history of “who did what” is never available or known. Lots of sitting, lots of fast throttle jockey sales broker trips to show off the “new boat” and very little of the real maintenance needed as the hours are so low on the engines. Ever see an owner’s manual talk about “Marine Age”. “Marine Age” is something that seems unique to a diesel in a boat – Without even using the vessel, the engine slowly goes south, especially if all you do is change oil and zincs per the maintenance manuals. Many or most vessels are over propped to some extent in that they do not even reach rated RPM, especially during the new owner’s “learning curve” which can be years and 100’s of hours later spread out over a few years. By the time the engines RPM’s are where they need to be, you have already stressed many parts of the engine well beyond its actual hours. The salt water cooling system of the engine is just not always that tolerant of the typical maintenance that is specified in the owner’s manuals. IMO, it needs extra “hands-on” care and thought based on your particular application needs. Believe me, not every vessels operation is the same. I speak from many 1000’s of dollars spent on both Cummins and Yanmar schooling over the last 25 years, and IMO, neither one had a clue about what it takes to really care for a SEAWATER AFTERCOOLED diesel engine making upwards of 60HP / liter – Read your manual as all they seem to print is “change your impeller, replace zincs, and keep the weeds out”. Want your very expensive seawater system (which is also the life blood that keeps your engine from having a “thermal melt down”) to last 10+ years on a light weight high speed diesel? You’d better plan on getting much more involved than that, and start this process when the engine is still young “Marine Age wise” and not just engine hour wise. And last, I am not probably being totally fair to some of the newer technology out there (Common Rail Engines for instance). For sure, the loads on the internal components must be less per HP produced because of the smoother combustion process (not just one nuclear type explosion) with each piston down stroke. So maybe we could add 5-10 % to cruise HP per liter and we could still sleep well at night. But on the other hand, I am not at all that comfortable with super light weight 3600+ RPM diesels converted from automotive use to marine use, and have no industrial, commercial off-highway, truck, or other market history that can show how tough they really are in other uses.. Driving the Autobahn at 80-100+ MPH has nothing to do with traveling at sea in a planing hull pushing into head seas and 10+ K’s of wind. So remember, work all of this into the equation when you decide how many ponies you want to pull out of your investment traveling from Point A to Point B for hours on end, versus amount of years you want to keep those engines running, performing as if they were close to new, and that investment is still paying dividends in the form of an overall reasonably low cost of ownership. * NOTE: Volvo has multiple continuous duty ratings at 1800 RPM and they are definitely at highest end of the true continuous duty spectrum.